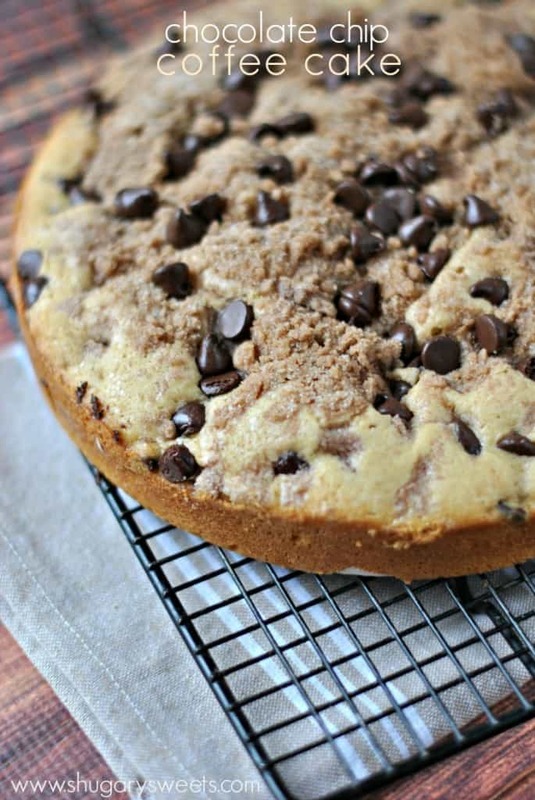 Chocolate Chip Coffee Cake with swirls of cinnamon and chocolate chips! Use some festive red and green chips for the holidays! While many people are weak when it comes to cookies, fudge, brownies, chips, ice cream…you get the point. I am weak when it comes to an irresistible breakfast cake sitting on my counter. 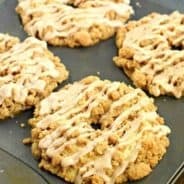 It’s the perfect morning treat that goes so nicely with my morning coffee (hence the name “coffee cake”). Today’s recipe was created using my Cream Cheese Cinnamon Streusel Coffee Cake recipe. Except of course, there is not cheesecake in today’s recipe. And I made it in TWO cake pans (one for now and one to freeze for Christmas morning)! I also used a smaller amount of streusel, but added in a center layer of chocolate chip and cinnamon swirl to these cakes. Can I just say, I love them. No, really, I love them and want to marry them. m’kay? 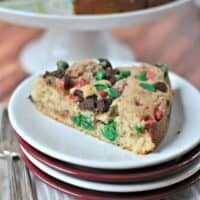 I found some red and green chocolate chip morsels at the grocery store this week and made one batch with those for a festive version of this cake. I also made a batch with regular chocolate chips. You decide which way to go! If you’re reading this post in the middle of June, you may want to use the regular chocolate chips. Just sayin. For the cake, grease and flour two 8 1/2 inch round cake pans. Line the bottom with parchment paper. Set aside. For the streusel, combine flour, sugars, cinnamon and butter in small bowl. Mix with hands until crumbly. Set aside. In a large mixing bowl, beat flour, sugar, baking powder, baking soda and salt on low until combined. Beat in softened butter until mixture is crumbly. Add in eggs, vanilla and buttermilk and beat until fully combined and fluffy. Pour half of mixture in bottom of cake pans, dividing evenly. Spread using the back of a spoon or a small offset spatula (yes it will be very thin, it's okay!) Top with half of the streusel, sprinkling it over both cakes. Add half of the chocolate chips, about 1 cup, dividing evenly between both cakes. Pour the remainder of the batter over the cakes, dividing evenly. Use your spatula or spoon to spread it out one more time. Top with the remaining streusel and chocolate chips. Bake cakes in a 325 degree F oven for 30-35 minutes. Remove and cool 15 minutes, then remove cake from pan onto a wire rack. Cool completely. Serve into slices or freeze in an airtight container for later use. ENJOY. 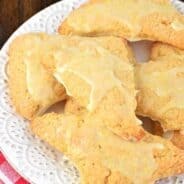 Best used within 3 days of baking (if not freezing). Obsessed with those Red and Green morsels? 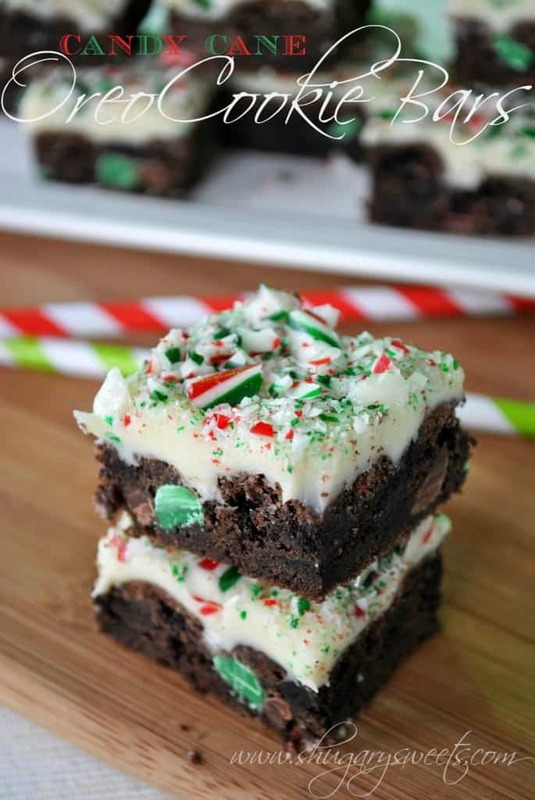 I used them in these Candy Cane Oreo Cookie bars! 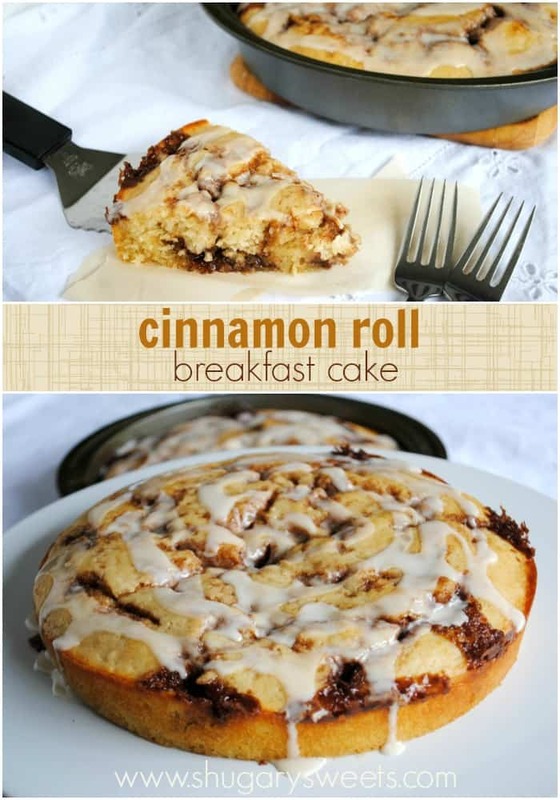 Cinnamon Cinnabon Cake is my most requested coffee cake in our house! I happily oblige. omigoodness this would be super impressive if brought to any holiday party! Thanks Marcie. My family thought it was fun to eat this early before Christmas too!! I’ll hop a plane and be there in a few hours. I love the fun colors of the holiday version. And I am weak around coffee cake too…can’t resist eating bite after bite!!! 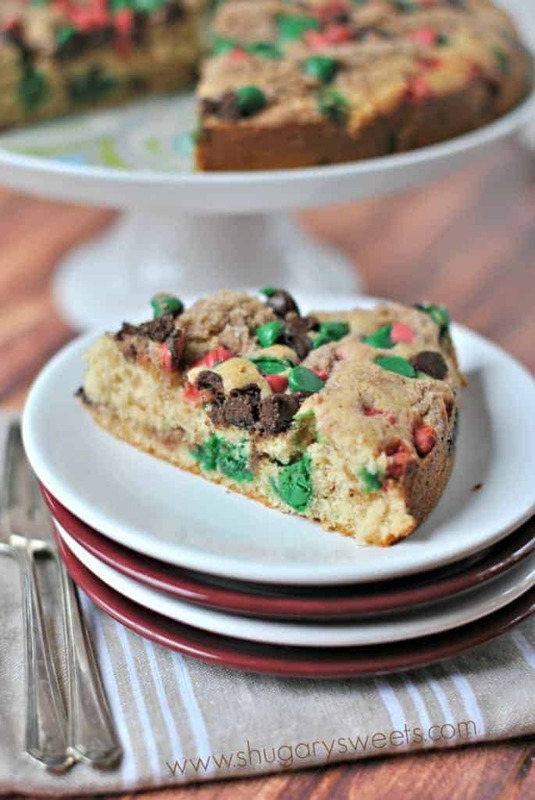 Chocolate chip coffee cake looks and sounds perfect for the holidays! Thanks for sharing, Aimee! Coffee cake is my weakness. I love how festive this looks! I so love coffee cake! It’s so much fun coming up with new flavors. This is fabulous! Don’t you just love those red and green morsels! This coffee cake is looking pretty good!! I do! they just make everything so much cuter this time of year! I have always liked coffee cake for the most part, but have never seen this version. I’m more used to a cinnamon or apply crumb coffee cake. What a cool take on the old coffee cake! Thank you!! It definitely was fun “recipe testing” this cake with holiday morsels and without!! 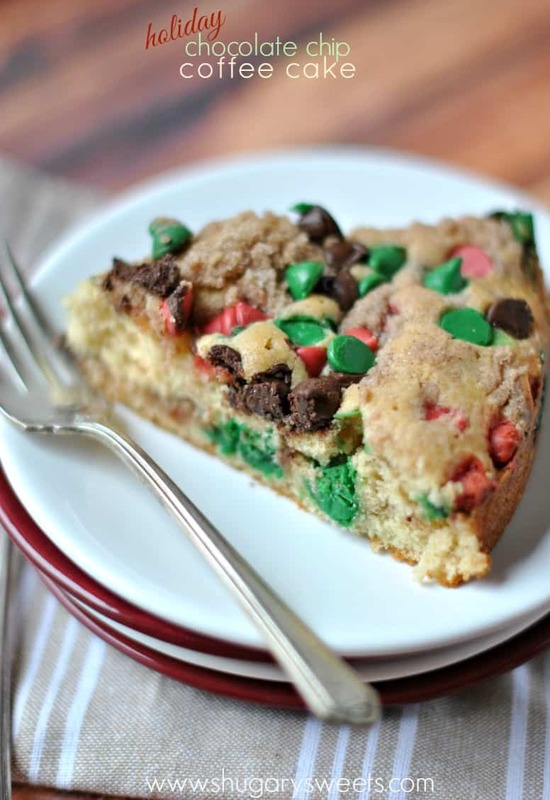 Oh, I love coffee cake…and this looks super festive with the holiday colors. Thanks!! Thanks David! I have one saved in my freezer for Christmas morning! Love it! So easy and so brilliant to swap regular chocolate chips for the festive Christmas ones. Instant perfect Christmas breakfast!! Love this idea! So fun! Mouth watering!! 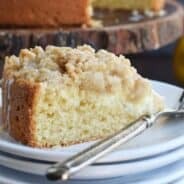 I love love love coffee cake, saving this recipe! Could you put this in a 9 x 13 pan? I’m at my relatives and can’t get out to get the round pans. if so how long would I bake it? You definitely could bake in a 13×9, just not sure for how long. I guess I would start at 35 minutes, and check every 5 until it’s done! Oh my this looks amazing! I made this this morning. Saw it on facebook and was in the mood, had the stuff so I just made it. It was delish. I used 9″ round pans, skipped the parchment paper and used pam for baking to spray instead. My family all enjoyed it. Stuck one in the freezer. It took 35 min in my oven. Thanks for the wonderful family friendly recipes. Love when the baking spirit strikes. And I’m glad you enjoyed the recipe!